Drivers played rock, paper, scissors to decide which car went first in a lane – easily a much better alternative to some of the road rages you often see. Marco Sanchez was sitting in his car in a traffic jam on Friday, (April 27) and was looking to merge onto the freeway. Instead of edging his car into the lane, he decided to introduce a game of rock-paper-scissors to see who went first. 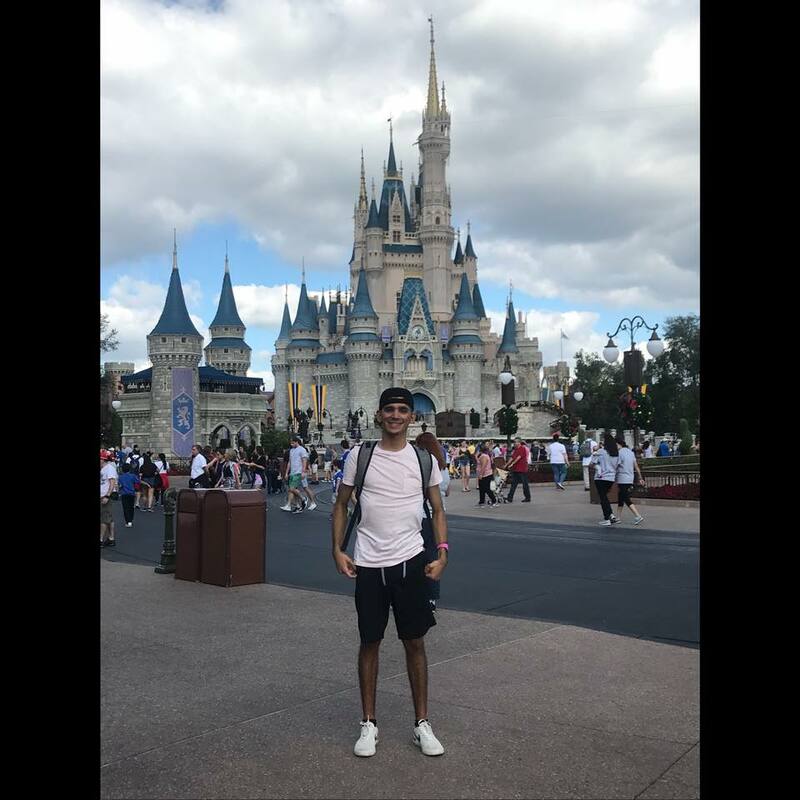 The video posted on Sanchez’s Facebook page has been shared more than 35,000 times, at the time of writing. In the clip, you see Sanchez winding down his window, before making the hand gestures across the lane with the other driver, who appeared to not understand what was going on at first. You’re trying to get in? I’ll let you in if you win. The other driver took up the challenge, so they went on, shaking their fists, both selecting scissors. In a second round, Sanchez lost after producing another pair of scissors while his fellow driver produced a rock. Sanchez could then be heard laughing as the man moved in front and into the lane. He said although he was stuck in traffic he wanted to make other drivers ‘smile and have a little fun’. So I saw this guy trying to cut in for some few minutes and no one was letting him go by. So I decided to give another challenge before I let him go by. I’m still shocked. I never expected this to go viral. Sanchez said he appreciated the other driver going along with the game. 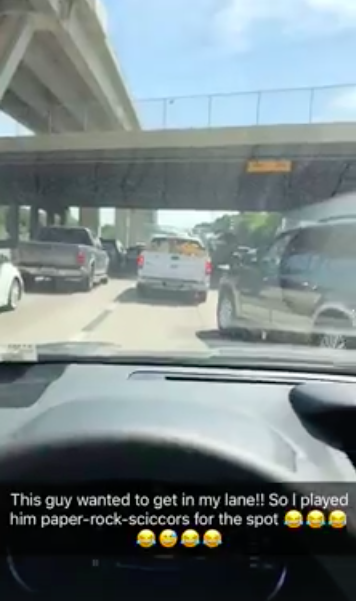 Houston traffic makes people even more angry after a long day of work. But are you somebody who finds themselves angry on the road, incapable of remaining calm at the slightest display of arrogance in the form of other drivers? 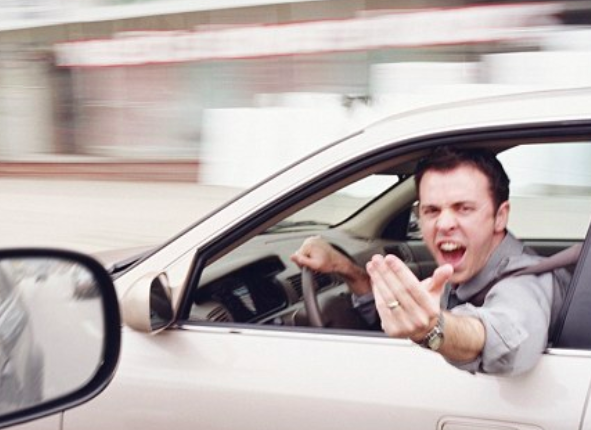 Fines of £1,000 will be dished out in the UK to road-ragers , so stop the rude gestures. 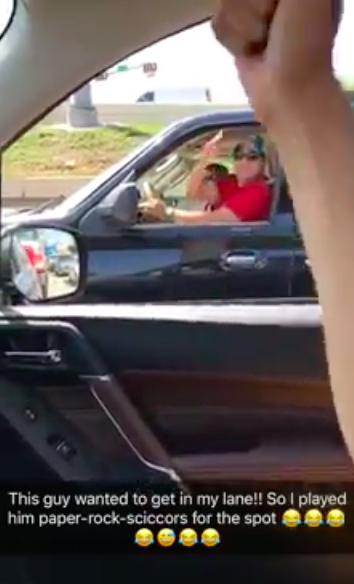 Yep, the simple act of flipping a ‘v’ at the traffic lights could see you on the receiving end of a pretty brutal penalty. BBC presenter Jeremy Vine said he’d witnessed more than 40 motoring offences on his daily commute. Vine claimed he was shouted at and told he’d get ‘knocked out’ during a road rage incident in west London in 2016. Seven years ago when I started, my very first thought was, we don’t need to change the layout of the roads, we need to change the mind of the driver. I went along in quite a happy-clappy way, thinking as long as I give the drivers a bit of love and understanding, gradually we’ll all learn to share the roads. Sadly, I’ve come to the conclusion we’ll never completely reduce, eliminate the number of really angry, dangerous drivers and therefore, sadly, the answer is layout.